The quantification and assessment of groundwater are of great significance for the urbanization and town planning in an area. 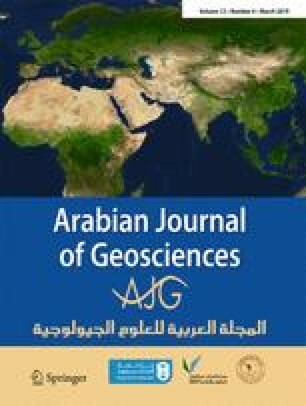 The current study has been carried out for quantification and assessment of groundwater quality zones by using geo-electrical technique in Faisalabad area (73° 06′ 08″–73° 11′ 59″ E; 31° 35′ 00″–31° 40′ 39″ N) of Pakistan. Vertical electrical soundings (VES) at six locations were conducted by Schlumberger configuration up to 300-m depth of investigation. Modeling technique is used for the interpretation of apparent resistivity, and the true resistivities of various subsurface lithologies were recorded from 2.10 to 55 Ω m for the depth of investigation. Three sand-dominant aquifers were identified at depth intervals of 0–50 m, 50–100 m, and 100–300 m. The VES results are compared and calibrated with the available borehole data taken from the tube wells drilled in the vicinity of the study area. The GIS technique is applied for the preparation of water quality zonation maps. Some of the groundwater quantification parameters such as total volume of the alluvium, total volumes of the water content, and active storage are estimated through GIS applications. Top geo-electrical layer (0–50 m) is dominated by low resistivity zone (10–25 Ω m), having an active storage of 0.71 km3. Intermediate geo-electrical layer (50–100 m) comprised coarse sand with low-to-medium resistivity zone of 10–35 Ω m, showing a low active storage (1.01 km3). Deep geo-electrical layer (100–300 m) is dominant by very low resistivity zone (< 10 Ω m) in the whole area. This 200-m-thick zone is possibly an admixture of fine sand, clay, and silt, having a high active storage (4.06 km3). The quality of water deteriorates with depth, and aquifer zones saturated with marginal-to-saline groundwater are interpreted below the fresh water zone at all the probe sites. The active storage of the lower geo-electrical layer (100–300 m) indicates a huge water potential but it is trapped in medium sand and alternative layers of clay. The intermediate geo-electrical layer (50–100 m) is comparatively better in quality but has low ground water potential.